was the conserved vis viva. It was later shown that, under the proper conditions, both quantities are conserved simultaneously such as in elastic collisions. 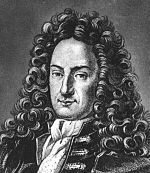 It was largely engineers such as John Smeaton, Peter Ewart, Carl Holtzmann, Gustave-Adolphe Hirn and Marc Seguin who objected that conservation of momentum alone was not adequate for practical calculation and made use of Leibniz's principle. The principle was also championed by some chemists such as William Hyde Wollaston. Academics such as John Playfair were quick to point out that kinetic energy is clearly not conserved. This is obvious to a modern analysis based on the second law of thermodynamics but in the 18th and 19th centuries, the fate of the lost energy was still unknown. Gradually it came to be suspected that the heat inevitably generated by motion under friction, was another form of vis viva. In 1783, Antoine Lavoisier and Pierre-Simon Laplace reviewed the two competing theories of vis viva and caloric theory. Count Rumford's 1798 observations of heat generation during the boring of cannons added more weight to the view that mechanical motion could be converted into heat, and (as importantly) that the conversion was quantitative and could be predicted (allowing for a universal conversion constant between kinetic energy and heat). Vis viva now started to be known as energy, after the term was first used in that sense by Thomas Young in 1807.
which can be understood as finding the exact value for the kinetic energy to work conversion constant, was largely the result of the work of Gaspard-Gustave Coriolis and Jean-Victor Poncelet over the period 1819–1839. The former called the quantity quantité de travail (quantity of work) and the latter, travail mécanique (mechanical work), and both championed its use in engineering calculation. In a paper Über die Natur der Wärme, published in the Zeitschrift für Physik in 1837, Karl Friedrich Mohr gave one of the earliest general statements of the doctrine of the conservation of energy in the words: "besides the 54 known chemical elements there is in the physical world one agent only, and this is called Kraft [energy or work]. It may appear, according to circumstances, as motion, chemical affinity, cohesion, electricity, light and magnetism; and from any one of these forms it can be transformed into any of the others." ↑ ৱাল্টাৰ লেৱিন (অক্টোবৰ ৪, ১৯৯৯) (English ভাষাত) (ogg). Work, Kinetic Energy, and Universal Gravitation. MIT Course 8.01: Classical Mechanics, Lecture 11. (videotape). প্ৰকাশক Cambridge, MA USA: MIT OCW. Event occurs at 45:35–49:11. http://ocw.mit.edu/courses/physics/8-01-physics-i-classical-mechanics-fall-1999/video-lectures/lecture-11/। আহৰণ কৰা হৈছে: December 23, 2010. ""150 Joules is enough to kill you."" ↑ Janko, Richard (2004). "Empedocles, "On Nature"". Zeitschrift für Papyrologie und Epigraphik খণ্ড 150: 1–26. http://ancphil.lsa.umich.edu/-/downloads/faculty/janko/empedocles-nature.pdf.